Minto Westside, presented by the Minto Group will be a spectacular condo development comprised of 4 towers standing 18 and 20 storeys (1250 units). This condo development will make its mark in downtown Toronto, changing the face of Front and Bathurst. 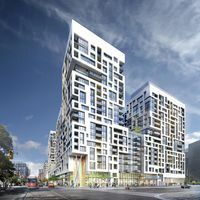 Minto Westside promises to enhance downtown Toronto with this modern design. Built surrounding one acres of courtyard space, this project promises to be bold and extravagant in a great location with endless amenities. One of the key features of Minto Westside are the amenities. The courtyard space, the close proximity to Toronto's Financial and Entertainment Districts, TTC, and its 8000 sq ft gym. Suites range in size from 330 sq ft to 1024 sq ft. Estimated occupancy is December 2017.